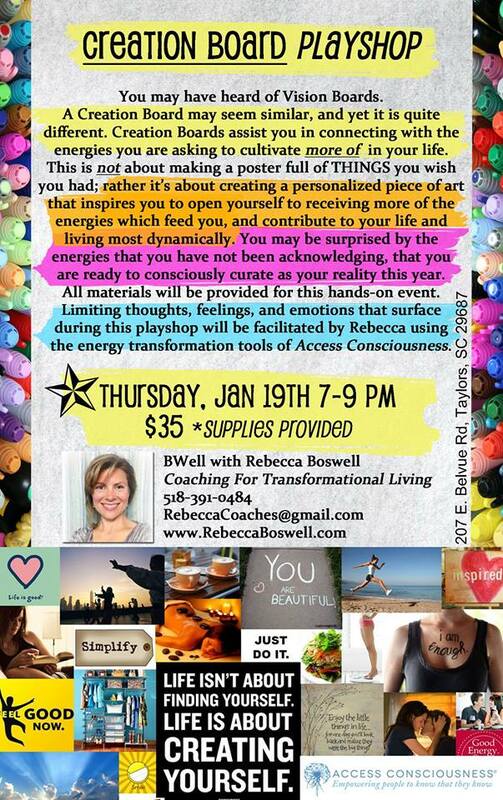 These classes are facilitated by Rebecca Boswell, or co-facilitated by Rebecca, to offer fun, new ways to blast through barriers, clear the mental muck, and create a life that works. These classes use a multitude of tools, including the Access Consciousness Clearing Statement. ​I don't know about you, but CHOICE has not always been my favorite word, let alone thing. In fact, I have had a long history of letting too many choices paralyze me until I didn't choose anything. Thing is, even when I thought I wasn't choosing, I was...just not anything consciously, and most of it created something other than what I actually desired. What are you choosing? What would you like to choose? Do these questions have you feeling squirrelly? Not even sure where or with what to start? This class series is about exploring possibilities in a fun way and blasting past analysis paralysis, as well as opening up to all the things (and energies) around us that we would like to include more of in our lives (whether we know what they are in this 10 seconds or not!). Choose all 3 classes in the series, or each call individually - Your Choice! Ready for to go on a shopping spree for your new reality? ​This class uses the Clearing Statement from Access Consciousness. ​A day with the horse gang, Rebecca Boswell, CF and Sayler Shiningstar, BF. What would it be like to have gentle kindness, simultaneously with potency and power? What would it be like to acknowledge where you are already being these things, and receive even more of it? You are invited to a day of frolicking, basking, playing, and neighing with the horses. Are you willing to acknowledge the horses as kind, caring, and being in their potency? Are you willing to acknowledge them as beings, healers, and receive all the capacities they gift you, as they request you to step into the same with them? This class is for playing beyond the energies of everything we have decided is our limit with nature, ourselves, the universe... and jumping nose first into the infinite possibilities available when we let loose and receive all that is asking to be acknowledged. This class utilizes the Access Consciousness clearing statement. among other transformational tools. NOTE: Please bring water, any "sun gear" your body desires (hat, sunscreen, etc. )," sturdy boots/shoes, long pants, and anything else that would contribute to your day. Some may like to bring a journal and pen for the day. A two-hour lunch will be allotted to refresh yourself, play with tools from class, trade body processes... Private sessions with Sayler and the horses available. Access Bars, Access Body Processes, Access Energetic Facelift, and Energetic Healing sessions available with Rebecca and Sayler, as well. Please contact us to book sessions. Are you interested in hosting a class like this? Please contact Rebecca for more information.